Havelock Pelorus Sound – a special place to stop. Havelock is not just a drive-by. This pretty little town is a very nice refreshment stop with very clean toilet facilities. 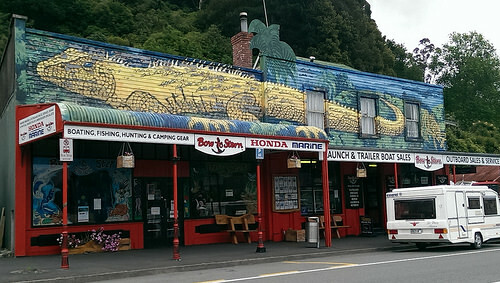 Towns like Havelock often have special attractions and today, I found one of them. There’s no better way of getting travellers to stop if all your cafes are lined in up in the main street. What traveller could refuse to have their photo taken outside this iconic landmark? 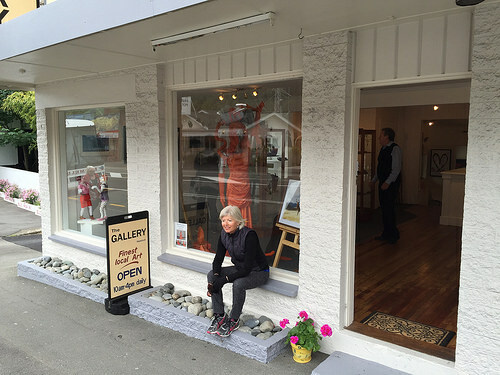 We found this beautiful newly opened little art gallery simply named “The Gallery Havelock” The Gallery Havelock is not only special for it’s carefully chosen display of local artwork, but it is also supplied and operated by very forward-thinking individuals. The locals have formed a Trust in which which profits are returned to the Havelock community. I met Brett Avison, a children’s writer and a volunteer at the gallery. 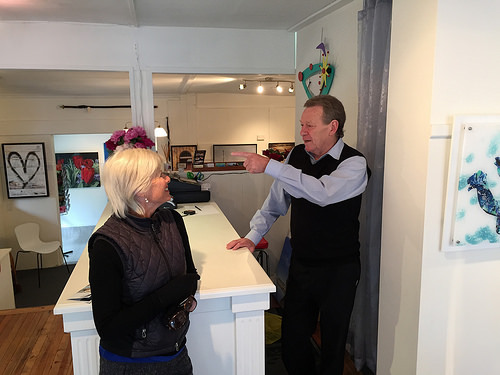 In the photo below, it looks as though he’s giving me my marching orders, but in fact he’s actually pointing out a sculpture made of pure whalebone, the value of which you might be surprised to see in a small town gallery. That’s the beauty of this lovely gallery. Artwork prices range from $35.00 to $10,000 and even at the lower end of the spectrum, it is authentic and quality artwork. I’ve found a treasure today and the folk here certainly deserve the success coming their way. Havelock you little beauty, thanks for all the reasons for making me stop, both humble and fabulous! It’s such a great survival tactic and I really think it’ll work for them. Travellers will love it,but they just need to know about it. Havelock is definitely not a drive-by anymore. oh Pam I want to go now! What a gorgeous little area and great community spirit. Love the look of the cafe and the art gallery – can’t wait, can’t wait……. 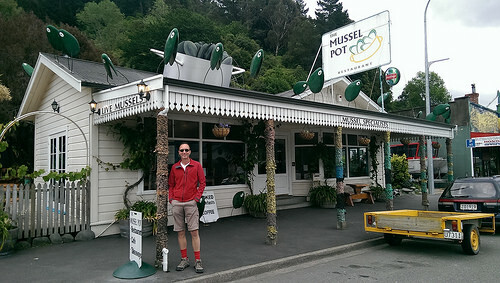 oh forgot to mention you put a grin on my face with your first statement – I thought you meant the Tuatara! Hey Jan, that’s funny..just had another re-read and it does seem as though that Tuatara was speaking from personal experience. Darn!